Conceived by Clinton C. Clarke in 1932, the Pacific Crest Trail (PCT) was designated a National Scenic Trail in 1968. It was constructed through cooperation between the federal government and volunteers organized by the Pacific Crest Trail Association; it was completed in 1993. 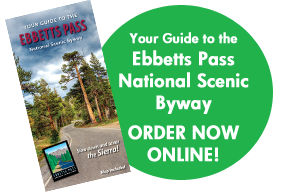 The 2,650-mile long trail crosses Highway 4 just east of Ebbetts Pass. Starting at the California-Mexico border, the trail zigzags its way to Canada through California, Oregon, and Washington, passing through six ecozones and nine mountain ranges along the way. Hikers and equestrian travelers enjoy spectacular alpine scenery and landmarks including the Mojave Desert, Big Bear Lake, Mt. Whitney, Kings Canyon, Yosemite and Lassen Volcanic National Parks, Mt. Shasta, Mt. Hood, Crater Lake, Columbia River Gorge and Mt. Rainier. Every year, about 300 hearty souls attempt to hike or ride the entire trail in a single season. Around the fourth of July, when the through-hikers typically arrive near Ebbetts Pass, “trail angels” leave oranges and inspirational notes for their enjoyment. A marker for G. Elmer Reynolds, the executive editor of the Stockton Record in the 1920s and an avid conservationist, was placed at the trailhead the year following his death in 1928. 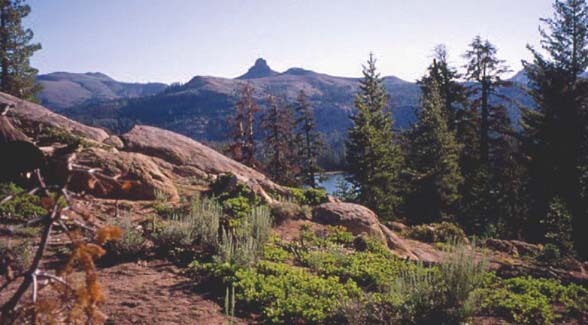 His namesake, Reynolds Peak, is visible to the west. south trailhead. A limited number of short-term spaces for day users only are available at the north trailhead. Do not park at the trail crossing. The PCT is best known for its long-distance backpacking opportunities. 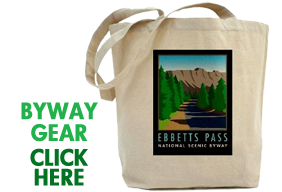 However, a number of great day hikes are available from the two trailheads at Ebbetts Pass. To the north, the trail follows scenic, rolling terrain about three miles to Upper Kinney Lake, passing smaller Sherrold Lake along the way. Hardier hikers can follow the trail southerly as it enters the Carson-Iceberg Wilderness and climbs about four miles to Noble Lake and beyond, affording spectacular views of Noble Canyon and Highland Peak, as well as a profusion of wildflowers in mid-summer.